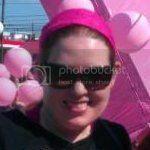 Last weekend, I adorned myself from head to toe in pink for a breast cancer awareness 5K in Delaware. That's not an exaggeration - I wanted to show off my new bright pink scarf from Smiles by JEM, but it was too warm in the morning to wear around my neck, so I tied it into a headband instead! By afternoon, it was even hotter (did I mention I got sunburned in OCTOBER?!) so I tied it around my waist instead. I'm impressed that the scarf was versatile enough for me to wear in gorgeous 80-degree weather. The temperature has dropped 15 degrees in the last few days and I'm ready to wear it around my neck like the model to the left. Isn't it cool how the colors fade from flamenco pink to light pink in an ombré style? 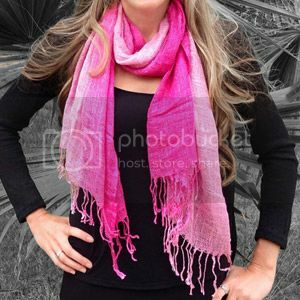 The pink cotton scarf is handwoven and measures measures 17" x 70." Janelle and her partner Megan live in Ventura County, CA but travel to Thailand to make and design all scarves. In fact, they just flew there this week! But don't dismay, their shop is still open. Use coupon code "THINKPINK" during checkout before October 31, 2013 to receive 25% off any order. Disclaimer: I received this free scarf as a thank you gift for hosting a giveaway. If you think your handmade creations would harmonize with my whimsical ramblings, learn how to sponsor a giveaway here. Love the pink! And that's great that it can be worn so many different ways. Janelle and Megan have a great company! The scarf is beautiful! I almost wore one the other day, but I knew by 10:00 it would have warmed up enough to where I'd sweating! I need to wait awhile before pulling out all my Fall favorites! Wow, that scarf is really pretty and I love how versatile it is. Now I would say that is improvising, what a great tribute to support BCA.